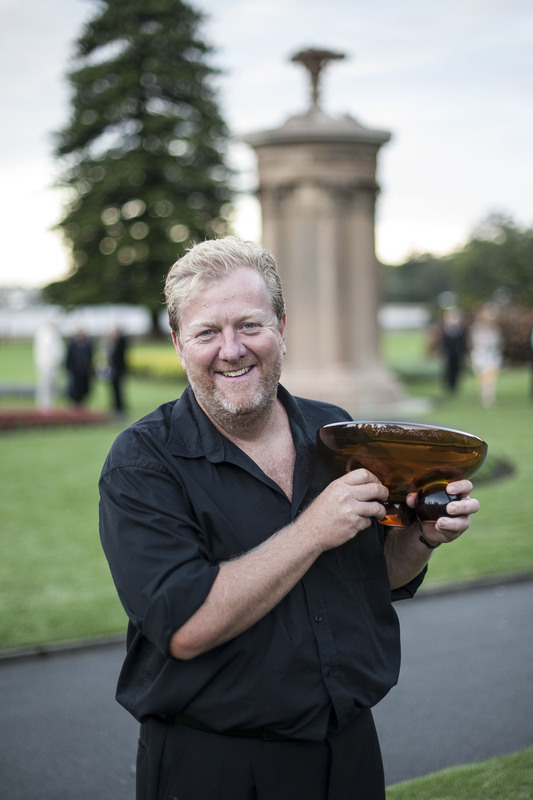 The inaugural Lysicrates Prize for new Australian playwriting was to have taken place in Sydney’s Royal Botanic Garden on the Band Lawn near the replica of the original Choragic Monument of Lysicrates that gives the competition its name. It would have been a lovely spot for such an event. However, torrential rain earlier in the week left the grass too wet for the seating stand, so the play readings took place in Verbrugghen Hall. 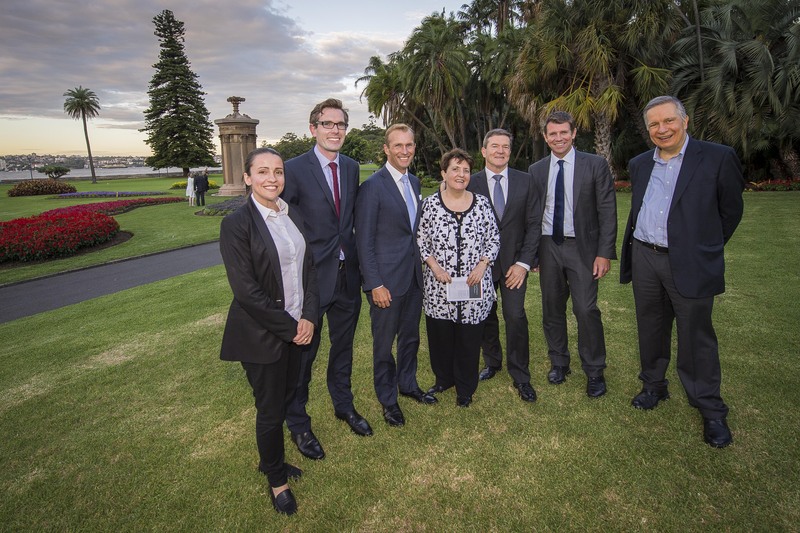 Guests then walked down to the lawn for the announcement of the prizewinner by NSW Premier Mike Baird. The Lysicrates Prize calls for Australian playwrights to submit the first act of a new play. The three short-listed submissions are given a rehearsed play-reading in front of an invited audience. What sets this Prize apart from any other Australian playwriting award is that the audience decides the winner – as happened in Ancient Greece. The prize is a $12,500 commission from Griffin Theatre Company, with the runners-up receiving $1000 each. The three finalists for the inaugural 2015 Lysicrates Prize were Steve Rodgers, Lally Katz and Justin Fleming, with Rodgers awarded the prize for his play Jesus Wants Me For a Sunbeam. It all began early in 2014 when John and Patricia Azarias, the founders of the Prize, took a walk through the Botanic Garden. John Azarias loves Hellenic culture and had seen the original monument in Athens. On that particular day, as he and his wife approached the sandstone replica (commissioned in 1870 by Sir James Martin), they were struck by how eroded it was becoming. He decided then and there to raise the funds for its restoration in readiness for the Botanic Garden’s bicentenary in 2016. The original monument was built by a rich sponsor (or choregoi) called Lysicrates to celebrate the winning play at the Dionysia Festival in Athens in 334 BC, as was the tradition during the 4th and 5th centuries BC. The monument has a frieze featuring Dionysus, the god of theatre. In a nice little link, the name ‘Sydney’ is an English version of the French ‘St Denis’, which in turn is a Gallic version of ‘St Dionysius’ – as John explained in his welcoming speech. Patricia suggested that they also establish a theatre competition associated with the monument as a way to celebrate its restoration. They approached Lee Lewis at Griffin Theatre Company, which is dedicated to the performance of Australian plays, who agreed to run the competition. With some assistance from the NSW Government, along with additional funds raised by John, and the support of the Royal Botanic Garden, they were off. For the first Lysicrates Prize, an audience made up of Griffin supporters and subscribers, politicians and theatre industry folk gathered at the Conservatorium to watch readings (rehearsed over three days) of the three short-listed plays. Entering the auditorium, audience members were each given a gold coin with which to cast our vote in large pottery urns. Rodgers’ Jesus Wants Me For a Sunbeam is adapted from Peter Goldsworthy’s novella and is a haunting story of suffocating love, grief and loss, and a family so close that the parents made an extreme decision when their young daughter is diagnosed with leukemia; a decision their son will struggle to understand. Darren Yap – who approached Rodgers in the first place about a stage adaptation – directed the extract, which was performed by Jennifer Hagan, Anthony Harkin, Natalie O’Donnell, Rodgers himself and Govinda Röser-Finch. The emotional scenario and complex moral dilemma posed clearly struck a chord with the audience. Rodgers said of his win: “Jesus Wants me For a Sunbeam isn’t a play yet. It’s just a bunch of scenes and ideas adapted from Peter Goldsworthy’s novel. But because of The Lysicrates Prize, we now get the chance to develop it into a truly important new Australian play. I’m over the moon. The evening began with Lally Katz’s Fortune, directed by Kate Gaul and performed by Briallen Clarke, Anni Finsterer, Sean Hawkins and Russell Kiefel. The black comedy is set in a seedy hotel in the US where the woman who owns it has asked a psychic with a crystal ball to tell her about a man who spent time in one of the rooms. The Romany fortune-teller is pregnant and she and her cowboy boyfriend desperately need money to start a new life on his father’s land. Meanwhile, two men who have just lost their Wall Street jobs in the GFC are waiting to book into the hotel: one of them has been around the block, the other is a young Australian who had only just joined the company. It’s an intriguing set-up, the characters are all fascinating and I can’t wait to see how it unfolds. The night wound up with Justin Fleming’s The Savvy Women, another of his rollicking, contemporary Australian adaptations of Molière, following his success with Tartuffe and The School for Wives. Directed by Gale Edwards, and performed by Andrea Demetriades, Morgan Powell, Fiona Press and Christopher Stollery, it began with two sisters vying for one man, their parents arguing over which daughter should prevail, and the mother’s sacking of the maid for her massacre of the English language. Fleming’s clever, witty rhymes drew much laughter, especially the maid’s bogan utterings. Having the audience choose is a different way of commissioning a play these days. The proof will be in the production. But you’d have to say it was an impressive, well-chosen short list. All three extracts were entertaining and showed significant potential; hopefully we will get to see productions of them all in the fullness of time.